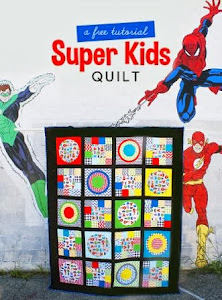 I haven't blogged too much lately because I have been working on applying these dresdens to the white background squares. Let me tell you how excited I was when I *thought* I was done and realized that I had only 29 completed. I was also under the impression that I had run out of most of the fabrics and making another one would be quite difficult - luckily I had enough scrap pieces to make the final dresden. Next step: apply the African heart print to the center. I was a little behind on the Blogger's Palooza, but now I only have one more to make before they post the tenth one on Tuesday. I wasn't thrilled with the "country" design of this basket block - but I do have to say that appliqued flying geese are a lot easier than the real thing. This block was the easiest one so far - a much needed break from the flying geese. I really tried to choose a contrasting color scheme with this block and I am not so sure how I feel about it. The flying geese came out HORRIBLE - but that's what you get when you are trying to rush. Here are the first eight all together - it's starting to grow on me, though I have to say that I am not as in love with these fabrics anymore. I will post my sister's completed queen size quilt and matching pillowcases in a few days. I have also been working on some pajamas for Gregory - he has long grown out of the whale pj's. I think the quilt looks lovely so far...the color palette is very relaxing and classic. I bet you'll like it when it's all done! Love the way the colors in the Dresden block POP! 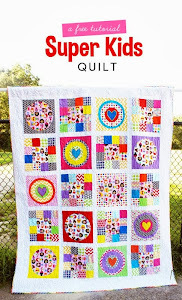 I do like the Tula Pink quilt, but I have to say I always want to stick with fussy cutting so many of her prints (esp. the new Parisville). Palooza Blocks, Snow, and Design Board!